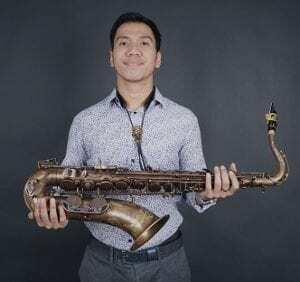 Desmond Amos is a young saxophonist from Jakarta who is ready to give a new color for the music industry in Indonesia. Desmond had loved music since he was a child especially Jazz, Fusion, Funk and Smooth Jazz. Since in the 3rd grade of Elementary School to 2nd year of Junior High School, Desmond took a Vocal Course. Since the first year of Junior High School to 2nd year of High School, he took private Bass Course. And since the 2nd year of high school until now, Desmond has focused more in playing saxophone. However, three of them ( saxophone, bass, vocal ) are taken in balance to support his career. He has now decide to be a profile saxophonist. In Desmond’s opinion music is a creation. It motivates him to create music because it is an achievement from hard work that can be appreciated by everyone in various forms.